One day you decided to buy your grandmother or grandfather, or your parents the latest Apple iPad 4th Generation with Retina Display. You gave them an iPad as a gift or present for this holiday season, special occasion or you just feel that they needed one. Now the moment they got their iPad they will surely ask you, “how do you operate this?” or “where’s the user guide for this iPad?“, or perhaps they might even ask you “can you teach me how to use this iPad?” Bamn! Now you’ve got another problem. For some people it’s fun to teach their seniors how to operate the iPad. But it may take some time to teach them. And most of the time you will have to repeat the instructions again and again for them to get it right. This can be time consuming on your part, specially if you’re busy. Or you might not be able to teach them how because you’re just indispose at the moment. So how do you teach them how to use the iPad? Luckily “iPad Pete” has made a very convenient iPad user guide that includes easy to follow video lessons that you can access anytime, anywhere. The iPad Video lessons contains tips and tricks about the iPad and how you can get the most out of your iPad. The lessons are updated regularly, so it includes tutorials even the latest iPad version running on the latest iOS 6. The iPad user guide includes the video lessons on all the things you need to know about your iPad; some tips and tricks that you might not even know it existed, basic iPad operation like reading and sending emails, listening to music and podcasts, organizing files and photos, using and exploring maps, apps and productivity tools and many more. The iPad user guide even includes advance training course like iOS 5 and iOS 6 training, iCloud training, how to make wireless updates, backups and how to sync your iPad, and many more. If you are worried that your folks might not be able to follow it, you don’t have to worry about that. It’s a video lesson, so all they have to do is watch the videos and follow the instructions. And since it’s already recorded, you or they can rewind it and repeat the instructions as much as they want. Pete’s iPad user guide (or video lessons) are not only great for seniors but it’s also recommended for people who owns an iPad but doesn’t know how to fully maximize the use of it. Remember an iPad is more than just a gadget. It’s a productivity tool and it suppose to help you produce more or help you with your job. You just have to learn more about it to fully utilize it’s function. 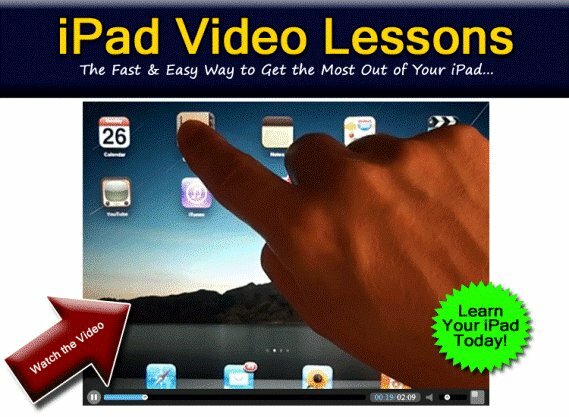 You can read the instructions and watch all the iPad video lessons on Pete’s official site here. How Much Memory or RAM Do I Need for My PC? 2GB, 4GB, 8GB or 16GB?